We’ve been using the PB Mining Bitcoin cloud mining service for almost a week already and since the BTC network difficulty just increased by about 21% we have decided to report on our current earnings with the previous difficulty. We have started testing the BTC cloud mining service by purchasing 1 GHS with a price of 0.0107 BTC per GHS for the purposes of our tests. Now, after the difficulty has been just increased the there is a new price of just 0.0089 BTC per GHS. This means that at the moment you can purchase 500 GHS for about 4.45 BTC as opposed to 5.35 BTC for the same hashrate last week. This price reduction with the increase in Bitcoin network difficulty is a good thing and makes the service even more attractive, so we are already considering of purchasing some more GHS. Let us see how things are going in terms of earnings, since our testing has started we got a small payment (they are sent every Sunday before Midnight) and currently our earnings from the 1 GHS purchased equal 0.00075838 BTC (not including the payment that was already sent). These earnings are for mining in the last 4 and a half days after we got a payment on Sunday. With the previous difficulty the estimate was 0.0001607 BTC per day earnings with 1 GHS hashrate so for 4.5 days this equals to 0.00072315 BTC and for 5 days 0.00080350 BTC. With our current earnings in between these two numbers we can say that we are very happy with the results we are getting so far. 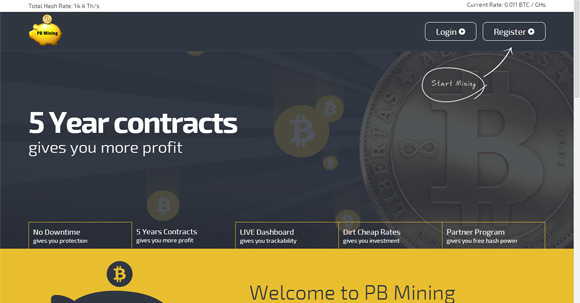 And with the update of the price for 5 years mining contract the PB Mining Bitcoin cloud mining service is getting more and more attractive option. Sure there are other alternatives available, but they try to not only sell you higher priced GHS, but also make you trade them while they mine for you in order to get higher profit (or loose more trying to do that). This service on the other hand is a long term contract where you cannot sell your purchase GHS, however they will continue to mine for you for 5 years with expected return of investment in roughly 6-8 months currently estimated. Will there be a new blog post coming soon? The site is closed for 2 month…–they have alternative site?